Nobody can outrun death, not even those epic dudes Bill & Ted. 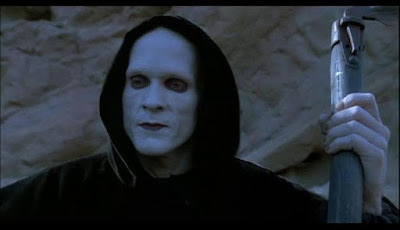 William Sadler played the embodiment of Death three decades ago in Bill & Ted's Bogus Journey, and now the character actor is about to return for the long-awaited sequel, Bill & Ted Face the Music. The news of Sadler's return comes from the movie's official Twitter, and it's good news to fans who are eager for the nostalgia of that first couple of movies. Keanu Reeves and Alex Winter are back in their memorable roles of Theodore “Ted” Logan and William “Bill” S. Preston Esq., two righteous dudes now middle-aged and on a quest to fulfill their destiny and write a song that saves the universe. The last time we saw Death was in the 1991 sequel when the Wyld Stallyns duo played him in various games to win back their souls after being replaced by evil robots. Sadler has been in a ton of movies including The Green Mile, Machete Kills, The Shawshank Redemption, Iron Man 3, and many more. He can be seen right now in Netflix's The Highwaymen as the father of Clyde Barrow, and has a role in Nicolas Pesce's reboot of The Grudge. Bill & Ted Face the Music is directed by Dean Parisot and opens in 2020.